↑ 2,00 2,01 2,02 2,03 2,04 2,05 2,06 2,07 2,08 2,09 2,10 2,11 2,12 2,13 Monarch Disease Ontology release 2018-06-29sonu — 2018-06-29 — 2018. ↑ 4,0 4,1 4,2 4,3 4,4 4,5 4,6 4,7 Reference Genetics Home (December 2014)։ «Williams syndrome»։ Genetics Home Reference (անգլերեն)։ Արխիվացված օրիգինալից 20 January 2017-ին։ Վերցված է 22 January 2017 This article incorporates text from this source, which is in the public domain. ↑ 12,0 12,1 12,2 12,3 12,4 Lashkari, A.; Smith, A. K.; Graham, J. M. (1999). 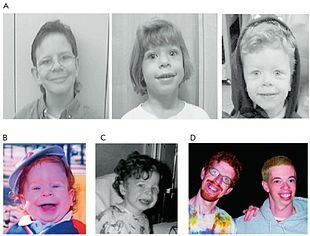 "Williams-Beuren Syndrome: An Update and Review for the Primary Physician". Clinical Pediatrics. 38 (4): 189–208. doi:10.1177/000992289903800401. PMID 10326175. ↑ Morris, Colleen; Lenhoff, Howard; Wang, Paul (2006). Williams-Beuren Syndrome: Research, Evaluation, and Treatment. Johns Hopkins University Press. pp. 70–71. ISBN 0-8018-8212-5. ↑ (չաշխատող հղում)"Williams syndrome – Genetics Home Reference" Archived 2010-01-22 at the Wayback Machine.. The U.S. National Library of Medicine. 2010. ↑ "Gabrielle director achieves perfect pitch" Archived 9 September 2017 at the Wayback Machine. The Georgia Straight, 24 January 2014.